Sometimes our cornice and plaster coving are not completely dry when supplied but please do not be alarmed. 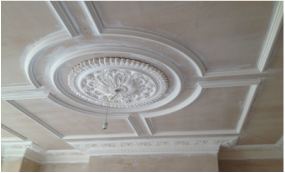 All cornice and plaster coving can be installed the day after are made. Truth is professional installers and plasterers prefer them this way as they provide more flexibility and when applying the adhesive you have more working time to fill all seems, gaps, corners and joints at once.